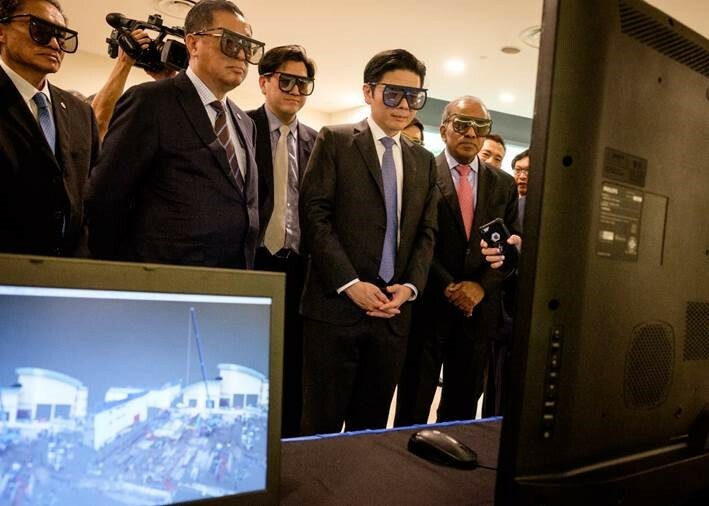 Donning 3D glasses, the men viewed a research project from the SJ-NTU Corporate Laboratory that involves creating a 3D building information models that will help in construction and building management processes. From left: Surbana Jurong Group Chief Corporate Officer Chong Lit Cheong and GCEO Wong Heang Fine, NRF Deputy CEO Dr Cheong Wei Yang, Minister Lawrence Wong and NTU President Prof Subra Suresh. The SJ-NTU Corporate Lab was launched yesterday as a collaboration between Surbana Jurong, Nanyang Technological University, Singapore (NTU Singapore) and National Research Foundation Singapore (NRF). The laboratory, sited at NTU, will develop next-generation sustainable solutions to tackle industrial and complex urban challenges. Its key objectives are to translate research outcomes into practical and viable solutions based on three core themes: digitalisation; green and sustainable urban solutions; and future of the industry and productivity. The S$61-million joint corporate lab is underlined by a five-year partnership, which leverages NTU’s strengths in engineering and sustainability research, and Surbana Jurong’s track record in providing urban, infrastructure and industrial solutions to its global customers. Surbana Jurong GCEO Wong Heang Fine said, “The Lab will be working on projects which will not only be game changers for Singapore but will also help to further establish Singapore as a global hub for sustainable urban and infrastructure solutions.” The SJ-NTU Corporate Lab was officially launched by Lawrence Wong, Minister for National Development and Second Minister for Finance.